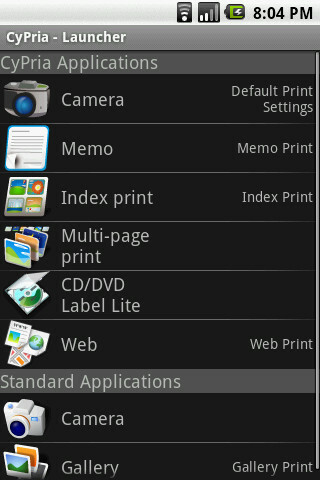 "CyPria (CyPria Free)" is an open platform printing application made for Android-powered mobile devices. 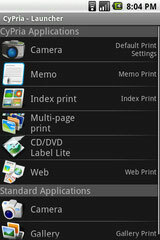 CyPria allows you to use your Android-powered mobile device to print pictures taken by camera, photos in gallery, Web pages, and notepad text directly from a Wi-Fi connected ESC/P-R supported EPSON printer, which CyPria will automatically detect by itself. Also, CyPria integrates its functionality into other 3rd Party Applications allowing you to print images and text from them as well. - Print multiple images on 1 page of paper by using "Index Printing". 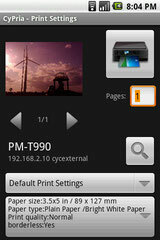 - Print multiple selected images consecutively by using "Multi-page print". - Print text/images on your CD/DVD by using "CD/DVD Label Lite".